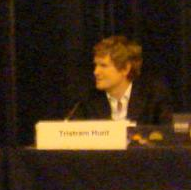 Registered 2 days ago – tristramhunt.com – so is he up to something in Leyton & Wanstead? There’s a piece on the website of the Leyton & Wanstead Guardian that Labour is rumoured to want historian Tristram Hunt as its candidate to follow Harry Cohen who’s standing down. The line is that Hunt would be worse than Dromey if someone were to be ‘imposed’ on Leyton and Wanstead and I agree. More of my thoughts on the selection here. Anyway, it seems to confirm he’s up to something. In light of comments I’ve probably been too tough to replicate Hunt’s data here, but all this remains in the publicly available WHOIS for the domain. Great piece of work – and nice website for Liz Kendall. But wouldn’t it be better if the Labour party could be a bit more open and a little less exclusive when it came to selections? Doesn’t anyone have the right to stand? And shouldn’t they be entitled to a fair hearing without having people who don’t like them trying to jeopardise a candidacy that may not even exist? Look at the WHOIS! The data is public. Is it really a good idea to have published what could be Tristram’s home address, email and mobile number here? If that was me I’d want that taken down.